Automatically draws graphs from log file over 10,000 lines, helps developers to detect memory and speed bottleneck. KYOTO -- June 26, 2006 -- Sophia Cradle Incorporated (Headquarter: Kyoto; CEO: Kazunori Sugiyama), an innovative developer of mobile phone software, today announced to release BREW[*1] profiler[*2] "Bleuet de BREW" for its cusomers. Bleuet automatically draws graphs from log file over 10,000 lines, helps developers to detect and solve memory and speed bottleneck. Mobile phone technologies are blooming these days. Such technologies like mobile audio player, bio-authentication are being implemented on the phone. Accompanied with the new technologies, mobile applications are becoming more complicated. However, due to the hardware restrictions of mobile phones, advances concerning speed and memory are required more than ever. 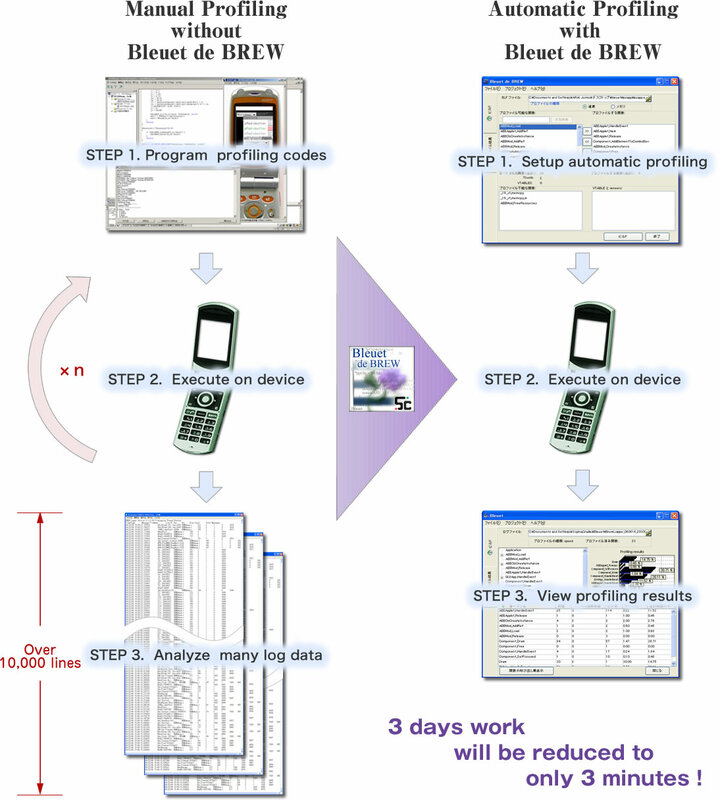 In order to solve this situation, Sophia Cradle Incorporated will release the world's first BREW profiler "Bleuet de BREW" beta version starting from 26th of June 2006. Currently, developers need to modify source code to inject check code for profiling, take the log, then read the log file over 10,000 lines long to analyze and find the bottlenecks of memory and speed. Bleuet is a BREW profiler, which automatically handles this whole process. It turns the log file over 10,000 long to a single graph and integrates all data into one table. As a result, for example, profiling processes that took 3 days can now be done in 3 minutes. It will enhance productivity by a great amount. Bleuet will be provided for free to over 150 Sophia Cradle's customers. This license can be used until 30th of June, 2007. A free trial edition for Bleuet will be provided to 300 companies who inquired about receiving free trials of any of Sophia Cradle's products. Free trial URL: Get Bleuet with any of Sophia Cradle's products. * Bleuet de BREW beta version is only capable of profiling applications written in C. The product version of Bleuet is planned in the end of 2006, 1 license fee is 393,750 JPY (tax included). Transfer the MOD file built by Bleuet, and then take a log file. Next have Bleuet read the log file to analyze it and display the profiling result in graph. 2001. BREW applications work fast no matter what the underlying system software in the handset is. An user can download a compiled BREW application from the Internet and use it with any BREW-enabled handset. The worldwide spread of BREW is so remarkable that there are currently 69 operators in 31 countries (as of June 2006) that provide BREW services, including Japan's KDDI that started offering it in February 2003. 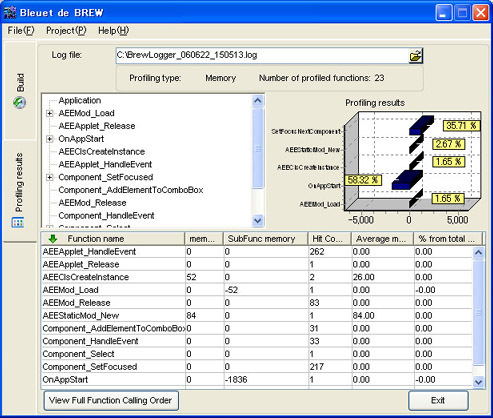 Profiler monitors the order in which the functions were executed, and counts the time required to execute these functions. It's ultimate aim is to find the bottleneck part of the program which deteriorates speed or leads to memory leaks. Bleuet is the first BREW profiler in the world.